In this world there are three kinds of games: AAA games which are your massive budget, massive marketing campaign games that sell millions of copies. Then you have AA games which are popular, they sell, but some work needs to be done to catch peoples attention. And then you have A games which are pretty much indie titles. They’re games that fly completely under the radar until someone with an audience brings attention to them. Rain is one of those games. Its not really an indie title, but it falls into that A game category. Prior to its release it popped up a few times at Sony events and maybe one article at a news outlet, but it really flew under the radar and was overshadowed by many other releases in 2013. I had been following this game ever since it popped up. A single trailer sold me on this game, but it wouldn’t be until 2015 that I picked it up because I actually had money. The game takes place in this interesting world where, at night, you turn invisible when you step outside. If you wander into the rain you become visible, and strange beasts wander in the rain. Playing as a young boy, you wander out into the rain when you notice a young girl running around in the rain and this begins your adventure through the rainy night. Saying that this game has a gorgeous art style is an understatement. It feels like a three-dimensional painting brought to life. And I’m not talking about those really colorful paintings that people splash paint all over and call art, I’m talking the really painstakingly detailed stuff that takes a while to make. On top of that, the atmosphere of the game is just so great. There is this constant somber, lonely tone to it that perks up whenever the girl appears sans monsters. The pitter patter of rain drops enhances this atmosphere. The soundtrack of the game can only be described as a masterpiece. It enhances the atmosphere and combined with the rain it sounds like your listening to music with Rainy Mood constantly running. And in case you’re not aware, Rainy Mood makes everything better. 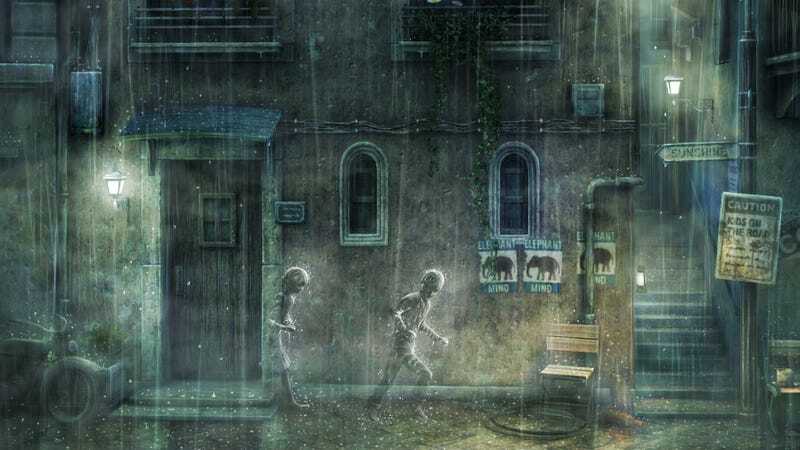 Rain is a game that deserves to be discovered by more people who like calmer, simpler experiences. Sure, you’ll occasionally be chased by monsters, but there are also a lot of quieter moments that really let the story and atmosphere sink in over a period of time and that to me is the heart of Rain, just as how the solitude of Journey’s, well, journey was its core. If I’ve piqued your interest, you can get Rain on the PS3 PSN for $14.99, and I can safely say that it is worth every last penny.